The Bee Balm (monarda) has rather run away this summer, but I couldn’t bear to try to tame it. I’m finding that the brilliant red is providing a handy backdrop for all kinds of subjects. I think I am going to try a whole series about this bee balm running wild. I just found out that I will be exhibiting at Dartmouth Hitchcock Medical Center in Lebanon NH this October through December, and I think the bee balm series might be something to try printing for it. This image proves to me some things I already know so well: you can make a photograph in natural light once. After that any attempt to improve or recreate it are rather iffy. It seems like it should be more than possible to refine a vision, but it’s tricky. This particular image was one of the first of about 200 images I made of this subject. Over a few day period, the bees were reliably working this globe thistle, and the red monarda backdrop wasn’t going anywhere. I tried some different lenses, tried optimizing the aperture for the blur of the background, even making some of those 40 Megapixel monsters that my micro four thirds camera can do with its sensor-shift technology (and those are good because the colors are often better and truer). Still, I think this might be among the best of the batch. Subject to revision. We’ll see. This image is for sale and can be viewed in higher resolution on its page. 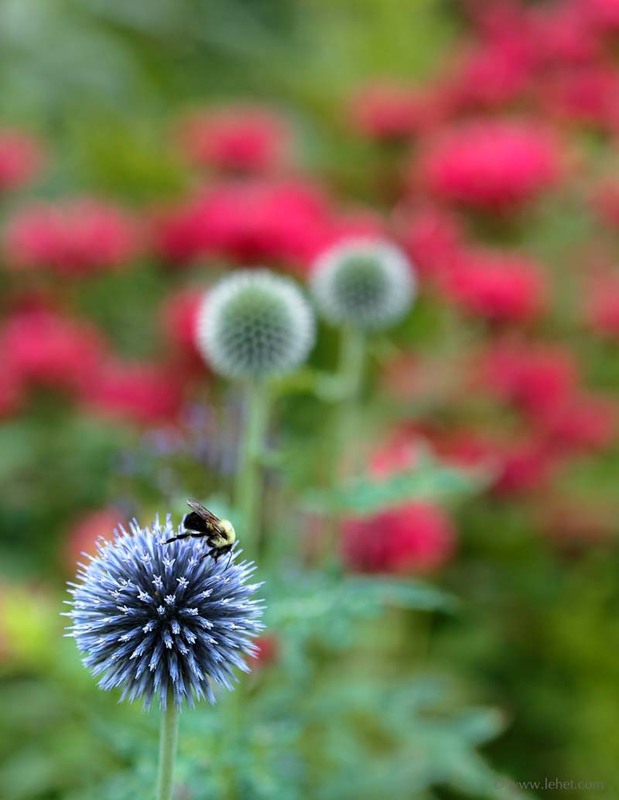 This entry was posted in Flowers, garden, New England, Red, summer, Vermont on September 11, 2015 by john lehet.